I can't uninstall or install the application. This particular box is not able to access the internet and I don't have physical access so most of the googleable results are not useful since they suggest running an exe from Microsoft. What are the manual steps to resolving this issues. There is no way I can physically reach this machine nor does there seem to be a way for me to get files onto it. This is code that I'm developing and testing. I've tried repair and remove which fails out. I've scoured the registry but I must be missing something here. If this is better on SuperUsers I'll gladly move it. 1001 always means an InstallUtil (Installer Class) custom action has failed. It's impossible to give you a more detailed answer because, well, it's a "custom" action. There is no telling what code is throwing an exception. If you want to save this machine and not have to rebuild it, you have to log the uninstall to get the name of the custom action that's failing, use ORCA to tweak the MSI to cut out the custom action, recache the MSI and perform an uninstall. 3) Never use InstallUtil custom actions. They are not a good pattern or practice. 1.Goto control panel then right click to get repair option. 2.Repair it and again uninstall after repair. Here you go the software is uninstalled..
msiexec.exe /I "File.msi" /QN /L*V "C:\Temp\msilog.log"
Open it in notepad, and search for value 3. Also check the system's event log for any clues. Most MSI errors like this will probably involve custom actions, or service configuration like Chris says. If this is really important to chase down you should get hold of Orca - the SDK tool used to inspect MSI files. You can see some screenshots of the tool in operation in this answer. And then inspect the Custom Action table and the end of the InstallExecuteSequence table (order by sequence number) and report what entries you find there. Unfortunately it seems the only way to get hold of Orca is by installing the Windows SDK. Alternatively you can download a trial version of one of the third party installer tools. My guess is that there is an immediate mode custom action after InstallFinalize that is returning an error code of some sort. 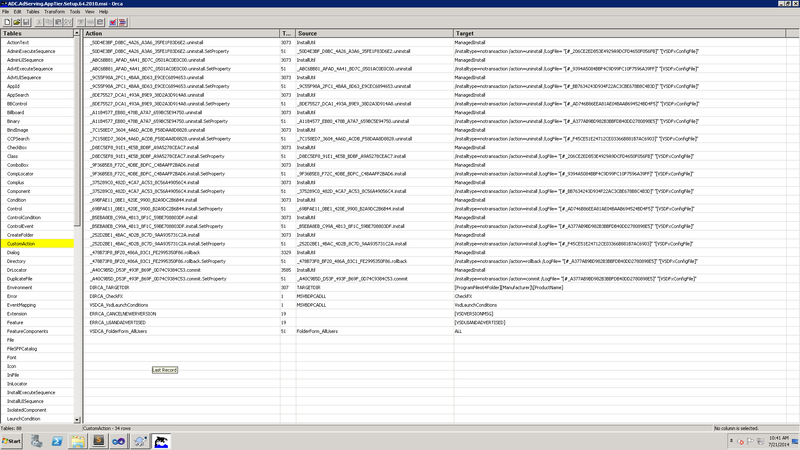 In short you can report all items AFTER InstallFinalize in the InstallExecuteSequence and we can probably narrow it down. Not the answer you're looking for? Browse other questions tagged installer windows-installer or ask your own question. How to rollback uninstallation in custom action?